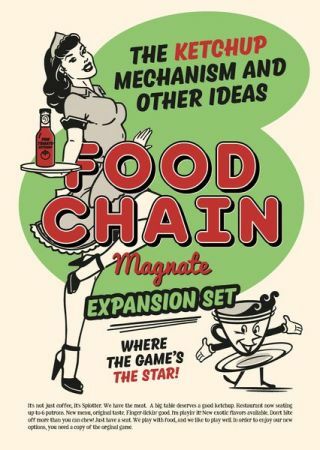 Food Chain Magnate: The Ketchup Mechanism and Other Ideas will be modular, which each of the several modules adding something new and different to the game. Obviously they can be mixed and matched. Materials for a sixth player. A new set of milestones to change the strategic options. Coffee and Barista's: places where people stop on the way to get food. Chef! Some of our guests are asking for ketchup. Do we have any?" "We don't serve ketchup in this company." "Also they are asking if the restaurant will expand anytime soon? There's a restaurant in the new quarter and with all the roadworks lately it is getting a lot of traffic." "Can't you see I am working on my new masterpiece? How can I concentrate like this? I need that Michelin star! And this new sushi dish is just the thing. Or maybe if I combine kimchi with icecream..." "But chef. Your guests are not asking for fancy stuff; they want ketchup and coffee. And better decorations. And a new menu." "Get out of my kitchen. Now! Food Chain Magnate is a heavy strategy game about building a fast food chain. The focus is on building your company using a card-driven (human) resource management system. Players compete on a variable city map through purchasing, marketing and sales, and on a job market for key staff members. The expansion is avaible for pre-order here. Update; The price, 75 euros, seems steep, but according to our sources at Splotter this is due to the number of components, so the production cost will be the same as producing the base game.